Photo courtesy of Vori Salzman. Found at clothing store in Nagoya, Japan. Take note of Bill Clinton’s advice, son. You might need it one day. At last, a shirt with something sensible to say! Who hasn’t relied on the ‘baffling with billchit’ strategy from time to time? And if that fails, just sue the luving krup out of them. Go on have a cigar. Money talks and billchit walks!!! I admit it, I’m baffled. I had no idea they’d changed the definition of denim to soft cotton. I won’t pay for that! This bill is just chit! I can honestly say I’m more baffled than dazzled. Sweater advertising works! Guess they ran out of space for “Bill’s Chitlins”. You keeps saying that phrase, I don’t think that’s the way it goes. That’s MISTER Chit to you, pal. or confuse them with Engrish! Uhhh, yeah. If I show them my receipt slips, they WILL be baffled. But don’t take chit from anybody else. …and always say, “excuse me” after you billchit. then you will understand why you can’t dazzle them with brilliance. And if that doesn’t work, phuc them up! hey… this isin’t real denim! THIS IS TOTAL BC! 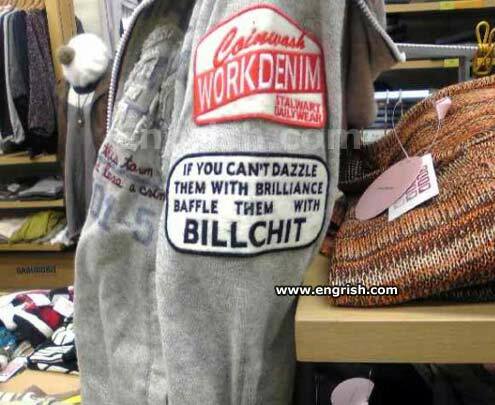 Every time you use billchit, Bill calls in his chits. Hello, I’m Bill Chit. Can we talk?